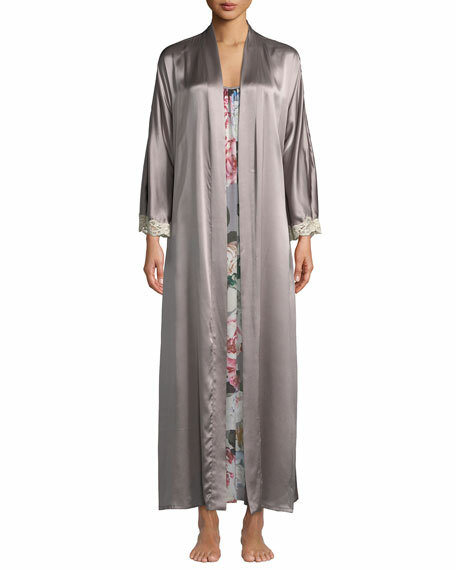 Hanro "Fleur" robe in slinky satin with stretchy Leavers lace insets. Self-tie sash at waist; interior tie. For in-store inquiries, use sku #2527924. Super-soft jersey with contrast lace-trim. Shawl collar; open front. Long sleeves. Hem hits above knee. Modal/spandex; hand wash, cold. Made in Peru. Soft jersey knit. Shawl collar; open front. Long sleeves. Self tie belt with angled ends. Front patch pockets. Cotton. Made in Bulgaria. 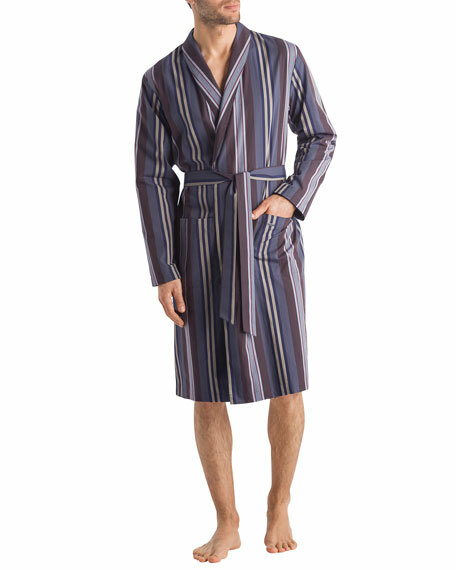 Hanro "Noe" striped, woven cotton robe. Shawl collar; open front. Long sleeves. Self-tie belt with angled ends. Deep front patch pockets. Imported.